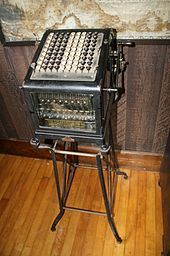 The adding machine was patented on August 21, 1888 by Wiliam Seward Burroughs. He called it a calculating machine. I think we all owe him a debt of gratitude. I know I use his invention (a much smaller version, of course) every single day. Another fact about him is that although he lived in Missouri, he died in Citronelle, Alabama which is close to Mobile and therefore, near me. AWW. I’m sure he’s pleased to hear it! Yep, a calculator is an essential tool here too. Thank heavens they are smaller now. Amen. Can you imagine tucking that puppy in your purse?